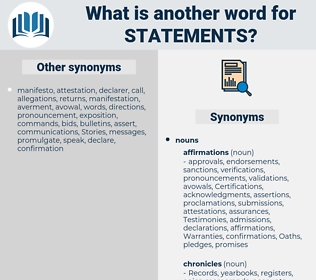 What is another word for statements? 'etats, operations, declaraciones, Standards, phrases, certificates, mentions, Penalties, credits, claims, appeals, thousands, Filings, exhibits, Activities, sates, estados, etats, briefs, factsheets, annotations, directions, sanctions, fiches, data, Goals, Databases, states, speeches. 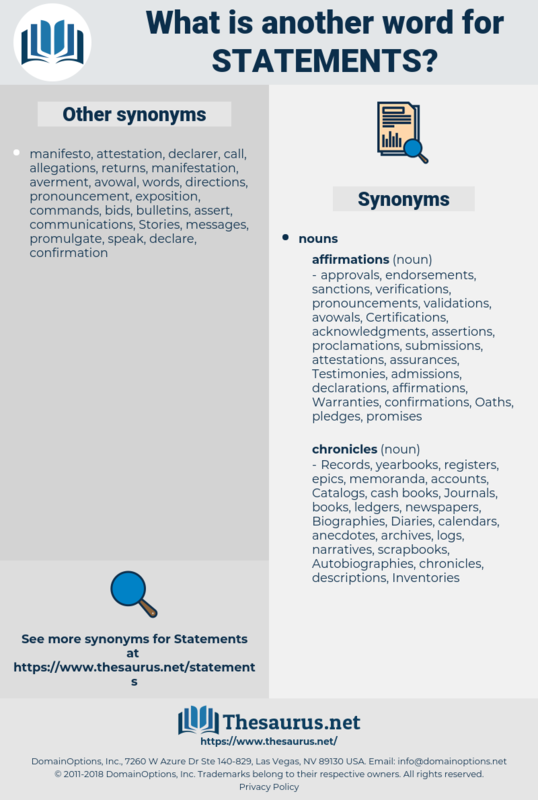 amendment, segment, steps, sates, actes, estados, article, etats, commission, Financials, advertising, ministry, ms, briefs, e., continuation, estates, zimbabwe, factsheets, cards, annotations, directions, working, debate, sanctions, trailers, advance, intelligence, NPT, Them, fiches, data, annual, robust, The, particulars, cuba, yearly, latin, VOTES, auditors, wto, Goals, paragraph, north, european, powers, ip, eu, F, solid, WIPO, explanation, explanations, un, speech, speeches, proclamation, affirmation. assessment, assessments, comments, agreements, arguments, endorsements, Recommendations, names, Advertisements, memoranda, memorandum, Testimonies, commitments, standpoints, demonstrations, proclamations, means, matters, manifestations, amendments, credentials, testimonials, requirements, minutes, attestations, mandates, enactments, assets, confirmations, affirmations, streams, Measurements, complaints, conversations, Commentaries, accusations, operations, Suggestions, initiatives, estimates, allegations, instruments, acts, clarifications, incidents, propositions, positions, times, transactions, assumptions, purposes, elements, representatives, components, events, liabilities, Measures, Standards, denominations, formulations, Migrants, ministers, principles, resolutions, Certifications, investigations, reassurances, numbers, justifications, viewpoints, considerations, narratives, things, developments, definitions, phrases, permissions, assurances, formalities, performances, statutes, participants, Respondents, amounts, stakeholders, understandings, articles, implications, certificates, registrations, designations, improvements, pleas, manuscripts, sstates, appropriations, leaders, appearances, interveners, 'interventions, Gestures, STRS, footnotes, answers, Stones, earnings, points, instances, revelations, Governments, witnesses, affidavits, factors, reservations, legislations, finances, self-reports, outcomes, effects, courses, inscriptions, comunicados, Stations, mentions, issuances, proposals, tasks, accountants, parts, tradeshows, settings, premises, Stories, reasons, disclosures, demands, petitions, Replies, Parents, pledges, provisions, promises, issues, predictions, quotes, Penalties, convictions, reactions, nation-states, drafts, Evaluations, warnings, panellists, Entries, questions, version, versions, values, keynotes, Publications, Entities, Attitudes, delegations, arrests, Ideas, Tests, sightings, dealings, Pleadings, excerpts, Analyses, recitals, credits, textes, Negotiations, materials, men, opinions, reserves, Visions, marks, outbursts, verdicts, quotations, slogan, slogans, conventions, occasions, Regulations, describes, Memoirs, inputs, Treaties, where, allusions, benefits, qualifications, speakers, reflections, exhibitions, grounds, sessions, by-laws, consequences, contributions, stubs, ratifications, Studies, results, proceedings, talks, clauses, motives, aspects, days, Expenditures, Licenses, IMPACTS, objectives, lists, obligations, systems, expressed, presented, laws, tokens, responders, advisories, advocates, affairs, stops, institutions, sequences, plans, posts, insights, billings, headings, bills, situations, sections, works, cases, so-called, notebooks, CBMS, clearances, Maps, requests, balances, notations, invoices, centers, Persons, faiths, deeds, permit, Permits, delegates, claims, expenses, charts, discours, appeals, Theories, forecasts, Incomes, references, PAGES, jurisdictions, Charges, applications, displays, Copies, samples, Foundations, Efforts, norms, Voices, markings, Motions, express, adverts, Inventories, checks, Duties, species, Exercises, contexts, Ones, decrees, cahiers, limits, Censuses, counts, Budgets, signs, exposures, commercials, consumers, protests, exits, protocols, Criteria, Telephones, offences, rulings, centres, topics, functions, Pensions, boards, pieces, citations, Textbooks, Prayers, reporters, regions, sids, tiles, toolkits, audits, licences, see, transcripts, Scales, Rallies, Filings, extracts, readings, Inquiries, propos, leads, crossings, Populations, contributors, scans, scripts, officials, novels, voluntary, contacts, titles, comprehensive, exhibits, sources, surgeries, monthly, Activities, Qualities, challenges, views, figure, figures, searches, pictures, Policies, elections, Donors, Phenomena, dollars, offers, closure, thereof, Economies, services, reviews, approaches, Moods, Memories, Securities, Formulas, tabs, codes, councils, media, Histories, books, targets, Crimes, options, types, vouchers, conflicts, grades, actors, calls, concerns, exclusives, lyrics, guides, nations, Refugees, Watches, shows, scores, tickets, frameworks, players, filers, origins, paragraphs, Rights, morocco, subjects, Ferries, hits, courts, meeting, meetings, Children, fairs, borders, features, Coins, NATIONALS, 23, 2003, thoughts, rolls, _, tips, Parties, plugs, offices, steps, Bases, iii, 1990s, birds, sates, LINEs, estados, article, etats, Financials, paras, briefs, estates, factsheets, cards, annotations, directions, sanctions, trailers, fiches, data, annual, particulars, VOTES, auditors, Goals, powers, explanations, speech, speeches. speaks, asserts, says, points, wishes, marks, describes, makes, views, Does, data, Databases. interpretation, ballot, ballots, auditor, communique, communiques, presentation, presentations, state, states, declarations. stances, messages, assertions, engagements, interpretations, misrepresentations, specifications, Essays, depositions, Manifests, admissions, protestations, confessions, sayings, conclusions, Interviews, expressions, passages, expositions, writings, utterances, discourses, text, texts, wordings, Languages, hearing, Hearings, contentions, recordings, orders, ballots, Databases, communiques, presentations, declarations. In proof of his statements, he produced the hundred - franc note and the scrap of paper.
" I want you to credit my statements," he said emphatically. student, stunt, Satinet, staminate, stone-dead, stint, squatinidae, sodomite, stemmed, sudden death, section hand, stent, statant, Satinette, stained, south wind, sixteenth, sweetened, sextant, sectioned, steam-heat, stunned, steamed, sustainment, stand, St. Matthew, shittimwood, sediment, satinwood, steam heat, stew meat, stoned, stannite, stomate, stunted, standee, sustained, sodium iodide, stand out, sweetmeat.